George Soros, Maintaining Political Interest Financier George Soros estimates he donated $27 million to organizations devoted to defeating President Bush in 2004. He has since expressed disappointment with both parties. 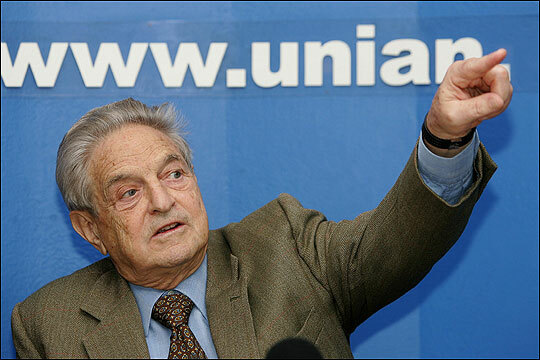 Soros talks with Scott Simon about the U.S. political scene. 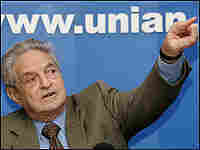 Financier George Soros estimates he donated $27 million to organizations devoted to defeating President Bush in 2004. He has since expressed disappointment with both parties. Soros talks with Scott Simon about the U.S. political scene. George Soros at a November 2005 news conference in Kiev, Ukraine. The Center for Responsive Politics says that George Soros donated more than $23 million during the 2004 campaign to MoveOn.org and other 527 or soft money groups trying to defeat President Bush for reelection. Mr. Soros, the financier who heads Soros Funds Management, has a new book out, The Age of Fallibility. George Soros joins us from member station WYPR in Baltimore. Mr. Soros, thanks so much for being with us. Mr. GEORGE SOROS (Financier, Soros Fund Management): It's my pleasure. SIMON: Of course, we also have to note that your foundation has given about a quarter of a million dollars to NPR in recent years. But let me ask you about the contributions you've made in politics. Firstly, does that figure, 23 million, that's furnished strike you as being about right? Mr. SOROS: No. I think it's 27 and a half. But I needs to be put in a context of my annual budget for my foundations, which is in excess of $400 million a year. SIMON: Does giving that kind of money, and become identified with that, create any kind of political backlash? Mr. SOROS: Well, it certainly has a political impact. And since I take rather strong positions, I encounter a lot of hostility. But I could think that means that I'm doing something worthwhile. SIMON: You say in this book, The Age of Fallibility, that you think great many people, Americans, have lost a sense of purpose in modern life. Mr. SOROS: I am, of course, a believer in an open society, but I recognize its deficiencies. And one deficiency is a lack of purpose. And that is one of the forces that drive people towards a closed society or towards an ideology that seeks to impose itself on the world, that endangers freedom. I mean that has been really a surprise to me to see that America, which I chose as my home and I considered sort of a model of an open society, imperfect but open to improvement, the institutions of democracy are currently undermined. And I attribute this to the after-effects of 9/11, and particularly the way we responded. And I question the war on terror. I think that was a false metaphor that the nation has accepted and it has been used by the Bush administration to actively mislead us and the world. SIMON: You write in the book that although you favor democratic candidates, that you don't have a lot of hope for the Democratic Party at the same time. Mr. SOROS: Well, I wouldn't say that. But I'm critical of the Democratic Party as well. And one of the main bases for my criticism is they have swallowed the war on terror. SIMON: You have some criticism in the book for what we now call globalization, a movement of people who own capital to do business in places that treat them most favorably. What do you think has been some of the cost of that? Mr. SOROS: Let me make it clear that while I'm a critic of globalization, I'm very much in favor of making it better and I think that globalization, as it currently prevails, is lopsided because it favors capital. Capital is free to move and therefore it's difficult to regulate or to tax. And since capitalism's essential ingredient in production, governments have to pay more attention to international capital than to the welfare of their own people. Mr. SOROS: Well, most - I want to make it clear, I pay taxes in my personal capacity. I report all my taxes, whether it goes through the fund or not. And the fund, actually, was created for non-U.S. citizens. I play by the rules that prevail, because if I didn't, I don't think that any investors would have entrusted their money to me. At the same time, as a citizen, I'm concerned about the rules. SIMON: You said that once you didn't want the foundations that you've created to survive you. You thought that you could rely on you to protect the foundation, but you wondered about what happened after you would be gone and boards then became the engine of the foundation. Mr. SOROS: Well, boards generally have a kind of fiduciary responsibility. And not in the - really in the position to take risk. Whereas I think to try to change the world, you have to take risk. And I can do it because it's my money. People coming after me will find it more difficult. SIMON: George Soros. His new book is The Age of Fallibility: Consequences of the War on Terror. Mr. Soros, thank you very much for being with us, sir.